Discussion in 'Downtown Hotels' started by Blonde_4_ever, Aug 9, 2018. I saw some photos on Twitter of room renovations at the Plaza and wondered what was going on. 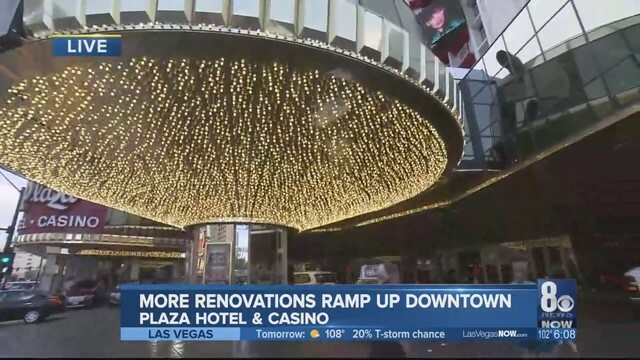 "The Plaza Hotel and Casino is kicking its renovations into high gear. They're starting from scratch with the project, so 100 rooms were stripped down to rebuild and improve the experience. It's just one of many steps hotels and restaurants are taking to keep up with the changes of downtown Las Vegas." I just emailed my host about this. My hubs is picky and I need to make sure the PH Suite I requested is available or he will be a no-go. I'm excited to see that the Plaza is working to make themselves competitive. With 18 Fremont coming on-line in the next few years, I worried that without some serious changes the Plaza might be put out of business. Just from a historical pov this would be horrible. Can't wait for the construction to be over. LOL I realize it just started, but one of the reasons I left Cosmo was that they are constantly under construction and it drives me bananas. I'm a weirdo that naps several times during the day when in Vegas and construction leaves me blurry-eyed and irritable. I guess I need to follow them on twitter to see these room renovations - unless you've got a scoop @Blonde_4_ever that you can share?? Do you know if the bathrooms will change at all? 100 Rooms? I wonder if they will continue with another 100 when the first are done. The Plaza is owned by the Tamares Group and they have big pockets despite the fact they use a management company to handle their day to day activities. All that stuff about how the owner of the Tamares group is a loser at running casinos (see old local articles) is ridiculous. His son runs things out of London and it is a very profitable company. If they want to upgrade they don't have to go searching for financing in my opinion as they could finance quite a lot as they are not a young company having been started just after WW2. They are listed as a "global private investment group". It is a very successful one according to many business sources. It is good to see them investing to upgrade the property. Oscar Goodman once wanted to tear that down and I'm glad they have said no to that idea. While others may disagree, I don't think we are going to see all these casinos at Symphony Park anytime soon so upgrading is good. Staffing can be changed easily while a property that has very tiny rooms cannot. In June 2005, Tamares acquired total control of the hotels and casinos from Barrick, including the and , as well as 40 other commercial and residential sites in downtown Las Vegas. However, Barrick was retained as the lessee of the casinos since Tamares does not hold a Nevada Gaming License. In December 2005, Tamares entered into a lease agreement with Navegante to operate the Las Vegas casinos through a subsidiary called PlayLV. The Queen of Hearts was later acquired by LiveWork Las Vegas. In July 2007, the Gold Spike was sold for $15.6 million to Gregg Covin. In January 2012, The Western was closed for an indefinite period of time. In March 2013, The Western was sold for $14 million to a company affiliated with Tony Hsieh's Downtown Project, a campaign to revitalize the Fremont Street area. In April 2013, Tamares announced that the Las Vegas Club will be closing its hotel. The casino will remain open. A possibility of a renovation for the hotel was hinted. In August 2015, the Las Vegas Club was sold to Derek and Greg Stevens, owners of The D casino, for $40 million. I don't think that taking naps during the day makes you a weirdo. If you were using a telescope to spy in someone else's room while they are taking a nap then that might qualify as a weirdo. Agree about the bathrooms. Bathrooms are becoming a key part of the hotel experience. Plaza rooms are larger enough to expand the bathroom footprint. Move the walls out and cover the sink. All that stuff about how the owner of the Tamares group is a loser at running casinos (see old local articles) is ridiculous. Oh they run casino just fine. Right into the ground. Barrick did little but actually run the casinos for them since they had no gaming license. Plaza is their last standing casino, the rest were sold as you said in your post. They were not sold because they were well run and making money. They sold for about what they were purchased for, not for much of a gain. Pretty sure they were all bleeding money before they sold. They seem to do fine with their main company, but I would say their venture into Las Vegas was mostly a huge failure. To give them credit, they entered the market at a horrible time. "Representatives from Tamares in London and New York were unavailable for comment. But in a statement the company said it planned to keep its other downtown hotel-casinos: the Plaza, Las Vegas Club, Western Hotel and Nevada Club." The only thing that surprises me is that they still have the Plaza. Well I didn't say they didn't appear to run a casino(s) badly. Sometimes people want to keep values down on property for whatever reason. I just said they could have been successful at it if they wanted to be. They have the resources. Keep in mind how many other businesses are owned by them in the downtown area(see org. post). It is a developers dream that likely goes along with those property values in the area. Also keep in mind they kept the land under a lot of their properties. They are a global investment group after all not a loser at running casinos group. Lets also not forget that his son and not the one in London is very connected to the arts district as well. Either way you cut it, the property is the key to redevelopment anywhere and they have enough money and there is enough casinos for sale that should they wish to involve themselves fully they could in my opinion. Besides, if I were a land developer I would keep the Plaza too as anyone who tried to eminent domain it to create an extension of Freemont street towards Symphony Park would face an uphill battle in my opinion taking that large of a group to court. The keeping of the Plaza basically ensures that development goes towards all those empty spaces away from the Plaza. It seems pretty smart for a "loser" if you ask me. Well I didn't say they didn't appear to run a casino(s) badly. Sometimes people want to keep values down on property for whatever reason. I just said they could have been successful at it if they wanted to be. They have the resources. Keep in mind how many other businesses are owned by them in the downtown area(see org. post). It is a developers dream that likely goes along with those property values in the area. Also keep in mind they kept the land under those casinos except LV Club. They are a global investment group after all not a loser at running casinos group. Lets also not forget that his son and not the one in London is very connected to the arts district as well. Either way you cut it, the property is the key to redevelopment anywhere and they have enough money and there is enough casinos for sale that should they wish to involve themselves fully they could in my opinion. Besides, if I were a land developer I would keep the Plaza too as anyone who tried to eminent domain it to create an extension of Freemont street towards Symphony Park would face an uphill battle in my opinion taking that large of a group to court. The keeping of the Plaza basically ensures that development goes towards all those empty spaces away from the Plaza. It seems pretty smart for a "loser" if you ask me. Guess I am confused, I had no idea that they had other businesses downtown, and I do not see anything in original post, except the 40 business thing, and I think that is a mistake. Shouldn't it be 40 acres? And are you sure they kept the land under the casinos they sold? I am under the impression they sold the property as well. Again, pretty sure Tony Hsei would not buy a closed business without picking up the land under it. That was his whole vision. You are right though. Some companies do not want to be successful for tax purposes. If that is the case, they are doing a bang up job. Well lots of info on that one I need to relook up but lets start with this article from May 12th, 2006 from RGT online which you can google; In 2006 they owned 35 acres of land and talked about a Main Street Entertainment district being created. Tamares Real Estate Investments is a global, privately owned real estate investment company based in London. It is a subsidiary of Tamares Group, headed by Poju Zabludowicz. Tamares is the largest landholder in downtown Las Vegas, owning 40% of the land. Tamares Real Estate Investments is a global, privately owned real estate investment company based in London. It is a subsidiary of Tamares Group, headed by Poju Zabludowicz. Tamares is the largest landholder in downtown Las Vegas, owning 40% of the land. Tamares acquires and operates its properties. Today, Tamares Group holds a $3 billion portfolio. Its real estate holdings encompass 2.3 million square feet of office space. Tamares forced Barrick to sell. The international real estate investment firm owns 40 properties in downtown Las Vegas from residential to RV parks to vacant lots. Now they will own 100-percent of Barrick's casinos -- The Plaza, Las Vegas Club, Gold Spike, and the Western. Current Barrick president and co-founder Stephen Crystal will stay on with Tamares to run the casinos in the short-term. Then he will oversee the future of the 40 other non-gaming properties Tamares owns in Las Vegas. Tamares will own 10 square blocks worth of property in downtown Las Vegas. With the addition of the casinos, the company will hold 15-percent of the gaming downtown. Tamares is a real estate company with holdings all over the world. In addition to the casinos they own 40 other properties in downtown Las Vegas, the company also owns buildings in New York and Chicago. You are correct there have been some changes since I last looked at the issue. The land under the El Cortez is no longer separate and has been acquired by Ike gaming. As for the DTP, they did acquire the land but from the article link enclosed you can see how much the Tamares group owns on East Fremont. Hsieh’s group plans to invest $200 million in downtown real estate. Last year, it bought at least 8 acres between Las Vegas Boulevard and 11th Street for about $19.5 million. “If you look at what they’re doing, they’re trying to buy everything on Fremont Street,” said real estate broker Brandon Wiegand, of Focus Commercial Group. New York-based Tamares still owns other real estate downtown, including the Plaza and retail property in the Fremont East District, including the Le Thai restaurant building. Ewww. Not likely. There's enough solid people watching under the canopy! LOL! Right? LOL! You always have the best ideas Mr. Flushie! Heard back from my host today. The 100 rooms are in the North Tower. She can confirm that PH Suites are not going to be affected for my September or October trips, but didn't divulge any other info. Glad to hear of the renos and super glad my trips won't be interrupted. I really hope they put a lot of thought into these renos. Last time they just used to opportunity to save a bunch of money by using the cast off furniture. They will need to try harder to be competitive with that end of Fremont Street. GG continues to improve and 18 Fremont is looming. Fingers crossed they pull it off. It depends on the distance. Binoculars wouldn't work for long distance viewing. Thanks, that is a lot of fun history to read up on, I had forgotten a lot of it. The most recent article was 2013. Again, all I am saying is I think Tamares did a horrible job of running the casinos they purchased. I think they do a likewise horrible job with the Plaza. No judgement at all on how they run their company. Kind of like Hooters run a great restaurant business, not so much Hotel or Airlines. IMO an unfair characterisation. They made a smart business move by buying furniture from Fountableu that had never been used. Cal and MSS are our places of choice, but I still think it was a smart business move on their part. I agree Joe. A LOT of the hotels did that. Everytime I stay somewhere new and see that carpet I just laugh. I am pretty sure the carpet in the rooms at the Tuscany came from there also. Cannot remember off the top of my head where else.